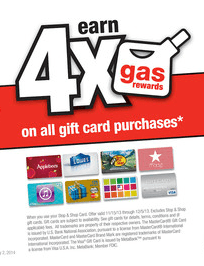 Stop and Shop has a gift card deal that will give you 4X gas rewards on (almost) all gift card purchases when you use your Stop and Shop card now through December 5, 2013. To break it down, you will earn 4 gas points for every dollar spent on a gift card. If you spend $100 on gift cards, you will receive 400 gas points which equals .40 off a gallon of gas. If you have a 20 gallon tank you would be saving $8 at the pump, which isn’t too bad. The maximum savings in this scenario would be $14 since 35 gallons of gas is the limit for gas rewards. Obviously if you buy more gift cards, you will save more on gas. You can only redeem 22000 points at a time for a maximum savings of $2.20 per gallon and leftover points would rollover to the next time. Gas points typically expire within one month, but will have the exact date on the receipt when you check out. If you have a car and are looking for ways to save on gas, this is a great way to do so. You can give the gift cards for holiday gifts or you can buy gift cards at specific stores you plan to shop at to help lower gift giving costs. For example, if you plan to go Christmas shopping at Kohl’s, buy a gift card that matches up with your budget and pay with the gift card. You can also combine the gift card with Kohl’s coupons and other promotions to help lower costs. You will also get the gas deal which helps with gas to the store. This is a great way to save even more money on your holiday shopping. How do you plan to save with your holiday shopping? Have you done Stop & Shop gas points before? *Also, I won’t be doing weekly grocery deals each week since there are so many great blogs that do the match-ups already, and they were a lot more work than I initially thought! However, if there’s anything great promotions or gift card offers like this, I will share them! Thanks, How to Shop for Free!